As our world progresses into ever more competitive stressful environments and life styles, various mental and psychological disorders have come to manifest themselves increasingly among the general human population. As our knowledge has advanced various methods and techniques have been developed to combat these disorders. One such method is the use of immersive technologies for controlled exposure to certain environments as part of the treatment process. Tele-Immersion is a technology which enables such immersive cooperative environments over long distances. Thus it has an immediate application in psychotherapy where psychologists can control and monitor their patients and their immersive treatments over long distances. 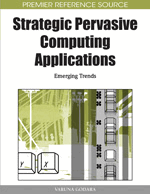 This chapter shows one such application model based in a tele-immersive environment and is based on the ongoing research on Tele-immersive systems and their applications at National Informatics Centre, New Delhi, India. Various studies report that the occurrence of psychological disorders is among the rise today among the general population. This has been attributed to several factors such as more stressful lives with more competition due to increasing population and ever decreasing sources, more responsibilities etc. The problem is that the increase in the number of doctors and psychiatrists has not been in proportion with the increase in population and occurrence of these disorders. Thus in many places it becomes difficult to obtain services of a competent psychiatrist without actually travelling long distances to established centres and big cities etc leading to big expenditures. This is especially true in developing and poor countries. The problem then is the development of methods to effectively provide psychiatric services to far flung areas and possibly more number of patients per psychiatrist to cope with the ever increasing demands. In other words we need to create methods of achieving patient psychiatrist interaction without requiring the patient or psychiatrist to move to the other’s location. The difficulty in this problem arises from the fact that we are in the domain of mental diseases in which there is no substitute for traditional “face to face” communication between the psychiatrist and patient. Thus we need methods using computing and communication technologies which simulate real interpersonal communication to a very high degree to essentially convince the patient’s mind in a manner of speaking. Specifically, the problem taken up here is the description of the software running on top of the hardware which will interact with the patient and psychiatrist over the Internet. Familiarization with the problem of psychotherapy coverage expansion. Review of existing hardware technologies required for new model. Development of solution requirements or judging yardstick to measure the model’s capability. Development of new model based on application of Tele-immersive technology to Psychotherapy alongwith a typical scenario for usage. Review of the CAVERNSoft Toolkit for implementation of model on given hardware requirements. Understanding the problems associated with proposed model implementation. Analysing future trends and possible solutions to encountered problems. Tele-immersion was originally defined in 1996 by Thomas A. Defanti of the Electronic Visualization Laboratory (EVL), as The integration of audio and video conferencing, via image based modelling, with collaborative virtual reality in the context of data mining and significant computations” [Leigh, et. al., 1997]. Since then, research on Tele-immersion has outgrown most of its system and performance-related issues and now focuses on supporting collaborative interaction and usability. Tele-immersion now deals with the “Creation of persistent virtual environments enabling multiple, globally situated participants to collaborate over high-speed and high-bandwidth networks connected to heterogeneous supercomputing resources and large data stores” [Leigh, et. al., 1997].